Getting out into nature is good for your body and your mind – and a little planning can make your outdoor experiences both safe and memorable. Below you’ll find safety tips to help you prepare for your next outdoor escape. Encounters with natural features such as wildlife, bugs and poisonous plants. Use the buddy system. It’s more fun to explore nature together — and a friend can help you if you get into trouble. Stay on marked trails or permitted areas at all times. You’ll enjoy your hike most if you plan your route in advance and stick to the designated trails. Bring a map of the area you plan to explore. (If one isn’t available, most smartphones have a built-in GPS that will help you keep track of where you are.) Be aware of any features or landmarks you encounter on your trip. Plan for the sun! Cover up: wear a sun hat, sunglasses and sunscreen. Dress appropriately for the weather. Dress in layers: wear warm clothing in colder seasons (and bring an extra layer). Dress in lighter layers for warmer weather. Weather can be unpredictable, so be sure to dress appropriately for the time of year. Even if the weather looks clear, pack rain gear — just as a precaution. Avoid forested areas on very windy days. Carry plenty of drinking water and a high-energy snack. Have a back-up plan just in case. Remember: trail and terrain conditions vary; wear closed-toe footwear appropriate for the terrain, season and activity at hand. 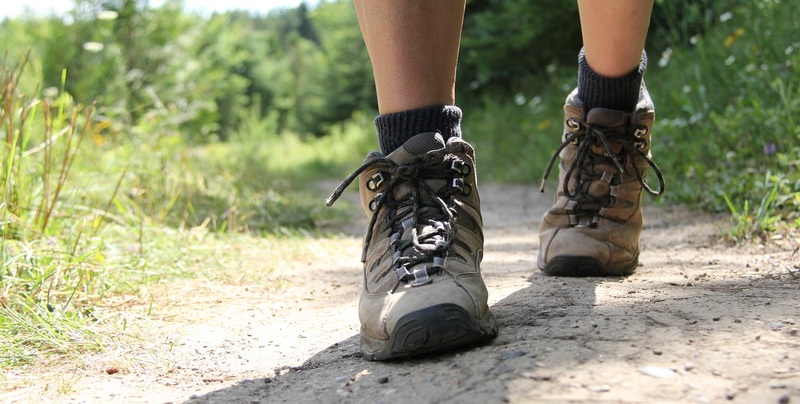 Put your best foot forward: choose closed-toe shoes or boots suitable for your outdoor adventure. If you do get lost, remember: S-T-O-P! Stop and do your best to stay calm. Think about when you last recognized where you were. Observe your surroundings. Look around for signs of something familiar. Listen for other people or activities you recognize. Maybe you can smell a campfire, or some cooking in the wind. Plan your next move. (e.g., Use your phone if you can, make noise or blow a whistle to alert others that you are lost). 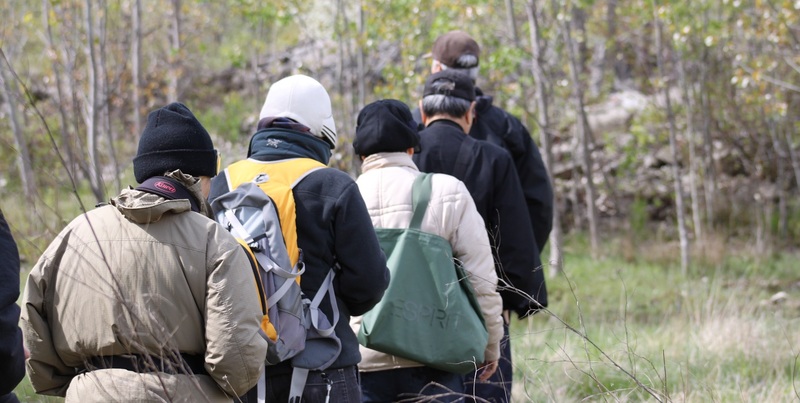 If a member of your group has gone missing on TRCA property, notify park staff immediately. If the person is lost after hours or in an unmanaged natural area, call 911. Outdoor activities at our conservation areas offer additional fun and excitement. But some, like mountain biking and cross-country skiing, present certain risks. These include falling down and colliding with objects or other people. Cross-country skiing is a great winter workout — but be sure you’re up to the trail conditions before strapping on the skis. Always assess and reassess your ability level in relation to the challenge ahead of you before choosing to participate in any activity. EXPLORE HERE to find the outdoor experience that is right for you. Let them know they won’t get into trouble for getting lost. If going on a longer hike or trip in a large natural area, give the child a whistle; you can even attach it to their clothes. Teach kids what to do if they get lost — it’s an important lesson for young and old alike. Tell them that people will come looking for them. If they see someone coming, they should blow their whistle or make noise. Remind them to look for people in uniform, or women with children. Come up with a password that you and the child will know in case a stranger needs to pick them up. Give the searchers the password to use. Make note of the clothes the child was last seen wearing; this will help searchers identify the child. In the event a child goes missing, call the park supervisor IMMEDIATELY. 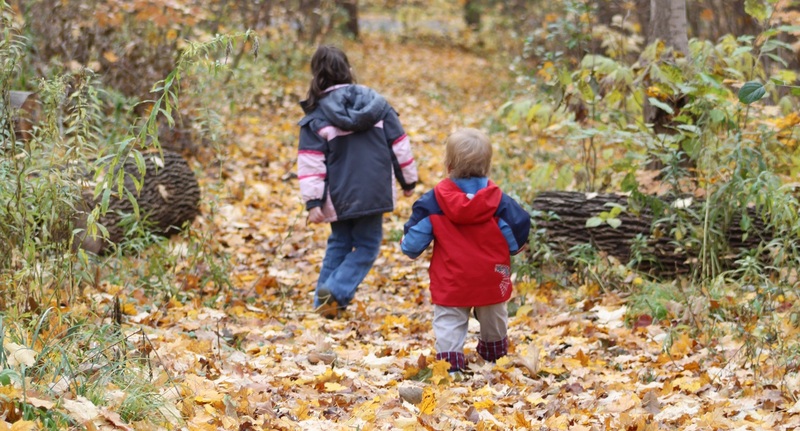 If the child is lost after hours or in an unmanaged natural area, call 911. Unfortunately, there are certain times of year when going into nature anywhere in Southern Ontario means bug bites. While most stinging bugs aren’t likely to cause anything worse than an “ouch” or itch, some individuals with greater sensitivity may have a more severe reaction to a sting or bite. Some insects in Southern Ontario do carry diseases, such as West Nile Virus or Lyme Disease. While the risk of contracting these illnesses is low, it’s important to be aware of the possibility. Lyme disease can be transmitted to humans through the bite of an infected black-legged tick. To learn more about the types of insects or animals that carry these diseases, please visit your local Public Health Unit website. Find the one nearest you by entering your postal code HERE. If you or someone travelling with you is highly sensitive to certain types of plants or animals, plan ahead: check with your Public Health Unit regarding advisories, and make sure you’re carrying any prescribed medication at all times. As an additional precaution, wear light-coloured long sleeves, long pants tucked into your socks, and closed-toe footwear. Certain plants in Southern Ontario may be harmful if ingested, or if they come in contact with your skin or eyes. These include poison ivy, poison sumac, giant hogweed, water hemlock, several species of mushroom, and others. The giant hogweed is one of several potentially harmful plants you may encounter in wilderness areas. The best way to avoid harmful plants when visiting a TRCA property is to stay in permitted areas and on trails, and to wear light-coloured, long-sleeved shirts and long pants. Refrain from touching plants, and NEVER eat anything that you find in the wild. If you or someone with you should experience faintness, nausea, vomiting, confusion, trouble breathing, a change in skin colour or any other type of emergency reaction after interacting with a plant or receiving a bug bite, call 911 IMMEDIATELY. Never feed wild animals. Feeding desensitizes them to human contact and increases the likelihood of a negative encounter. Leave them alone. If an animal is not bothering you, don’t disturb it. Make sure it has an exit route from where you are located, and do your best not to corner it or block its line of retreat. Don’t bother him, and he won’t bother you. If you have children, pick them up. Yell and make yourself look bigger. Your doctor or other health care provider. Your local Public Health Unit (PHU). Find the one nearest you by entering your postal code HERE. Telehealth Ontario: A round-the-clock free service, staffed by registered nurses, to provide answers to health-related questions.